A Nintendo amusement park? AWESOME !!! 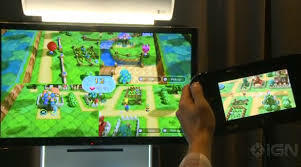 I remember when Nintendo Land first got announced at E3 back in 2012, I couldnt believe my eyes a Nintendo Theme Park with Attractions based on all of my favourite Nintendo IP’s, I was so excited and even though I didn’t own a Wii U at the time I couldn’t wait to watch people play it on YouTube. Nintendo Land was a genius idea but I couldn’t help being just a little sceptical because I remembered how excited I was for Wii Sports a game I thought I would love but instead I was bored of it after a week. so how was Nintendo Land? Nintendo Land does not really have a plot and I don’t see this as a bad thing because unlike other Nintendo Series such as Metroid and Zelda which have timelines connecting each game in the series, very interesting and epic character developments and some really in depth and well detailed story lines, the story in Nintendo Land is just that you are Mii visiting the theme park for fun and I personally think that as simplistic as this is it works perfectly considering where the game takes place. I like the idea of this game, you play as your Mii travelling across the ocean via the transportation of floating balloons, the idea of the game is to draw on the Wii U game pad to create a breeze of wind to help blow your Mii out of the way of obstacles. I understand why a lot of people will enjoy this attraction, it’s slow paced and at times it can be very gripping but personally I found it a bit boring and it’s one of the games I play the least often. Is it just me or does anyone else find this game to be a bit dull? 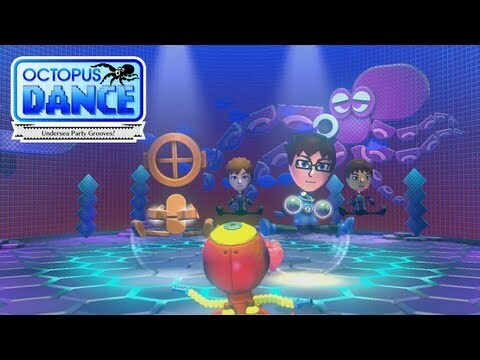 The idea of Octopus Dance is to copy the dance moves performed by the scuba diver by using the Game Pad’s two analogue sticks and that’s it. This is my least favourite attraction because compared to the other attractions I think its fair to say that its the most unoriginal, also sometimes the Game doesn’t recognise me copy the dance move and I lose a life which is really annoying. I was really excited for this attraction when I first saw it in Nintendo Land because the last F-zero game came out on the Game Cube so we haven’t seen a new F-zero game in a long time, I only have one problem with this and its not even the game it’s self, I hate that I have to look at the game pad while playing and all I can see is a birds eye view of myself and the track, while on the TV it looks like an F-zero game. I do enjoy playing this attraction but it’s the fact that I am forced to look at the game from a different perspective than what is shown on the TV and this factor really helps me too form a not so positive opinion. This attraction is a lot of fun especially when you have a bunch of friends over, any players using wii remotes will need to collect as many sweets as they can and drop the sweets into one of the many bowls located on the map, the player using the game pad must control the two guards, controlling one guard with the left analogue stick and the other guard with the right analogue stick. I had a lot of fun playing animal crossing sweet day with my brothers when they visited over the holidays. 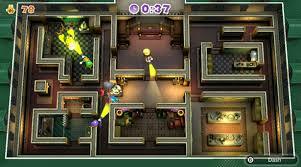 The idea of this attraction is that Luigi is hunting down an escaped ghost in his mansion, all players using the wii remotes will play has the ghost hunters and the player using the game pad plays as the ghost, in order to win the game either the ghost hunters need to drain all 100 of the ghosts health hitting the ghost with the beam of light shining from the flash light or the ghost needs to catch the hunters 3 times. This attraction is really fun especially if you like games which require a bit of strategic thinking in order to catch the enemy when they least expect it. 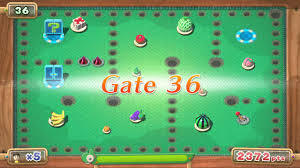 In this attraction you need to guide the Yoshi cart to all of the fruit and then to the exit door, you do this by drawing a single route to all of fruit and the exit, the only catch is that on the game pad all of the fruit is invisible so you really need to plan out your route carefully. Later the game gets really tough as it starts adding holes you fall through and by making you collect fruit in a specific order. If you are a fan of puzzle games then you will love this. Metroid Blast is the only game on Nintendo Land that I have actually managed to finish, the idea of the game is that you and a friend need to complete an objective while taking on a barrage of alien foes, these objectives can be anything from defeating all of the enemies on the map, collecting all of the character tokens, protecting civilians or overcoming a challenging boss fight. 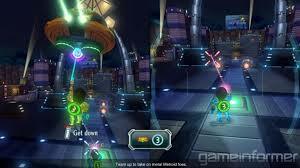 The mulitplayer aspect allows you and your friend to fight eachother, one person will take control of the spaceship with the Wii U game Pad while shooting their target from above land and the other players will remain on land and will work together to take down the space ship. Metroid Blast really is a Blast and it only makes me more excited for a future Metroid game on the Wii U.
Mario Chase is very similar to the animal crossing game, the only difference is that this time the objective is to either avoid the Toads or catch Mario. 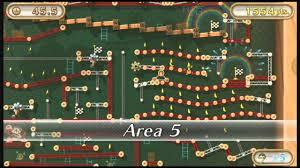 The reason I enjoy this game more than Animal Crossing Sweet Day is because in my opinion Mario Chase has much better maps, the Animal Crossing maps were fun but the Mario Chase maps are much bigger, you are able to pick up power stars, they have obstacles and one of the maps has slides. freaking slides !!!. 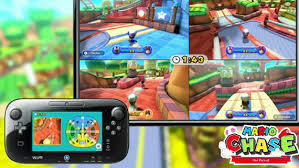 Mario Chase is a multiplayer only game but everytime you play it it’s going to be heaps of fun. In The Legend of Zelda Battle Quest you and your friends take control over what appears to be the four link’s from the Legend of Zelda Four Swords. The idea of the game is to defeat all of the enemies quickly and strategically until the hero’s manage to reach the Triforce which is located at the end of each stage, the Triforce is sometimes guarded by a boss, the player with the game pad will need to use a bow and arrow for some long range attacks on oncoming foes and any players using the wii remotes will need to attack enemies at close range with their swords. This game is really awesome to play especially with friends, I personally don’t like that its on rails but I understand that this does add to the challenge and many players will appreciate this aspect of the attraction. Donkey Kong’s Crash Course seems to be a very popular attraction among many of the guests who visit Nintendo Land and I think the reason behind this is because the game is very challenging but its also very fun to play which is a perfect combination for gamers of all ages. 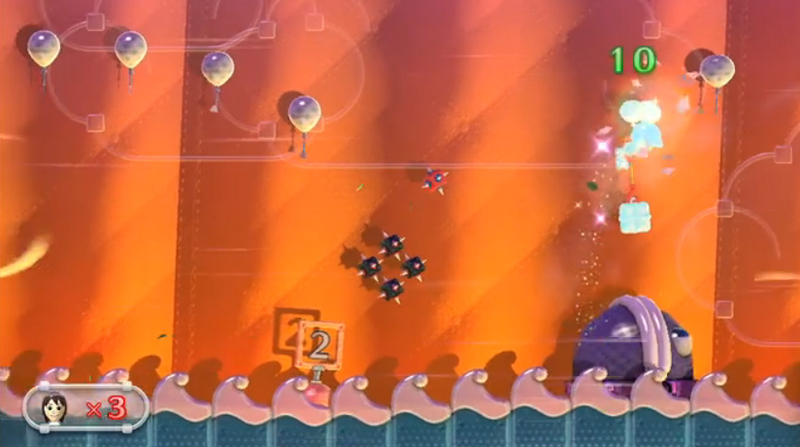 The idea of the game is to guide a rickety cart through an obstacle course which is filled with many fun puzzles for players to solve. This game is so far the only reason I have had to blow into the microphone on my Wii U game pad, its a quirky little feature that I hope more Wii U titles will implement in the future. Is Takamaru a new IP or have I missed out on a past Nintendo Series? In all seriousness I don’t know who Takamaru is but I do know that Takamaru’s ninja castle is wonderful. 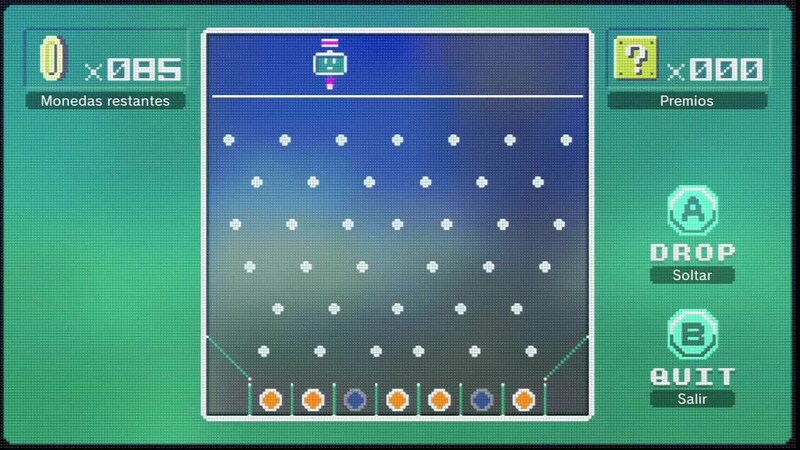 The player needs to turn the Wii U game pad vertically towards the tv, the player will then need to swipe the game pad in order to throw shurikens at paper ninjas who appear on the tv. This game really helps show the capabilities of the game pad and its so intense its bound to get your heart pounding. 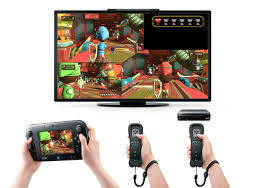 This is by far my favourite attraction in Nintendo Land, one player will use the Wii U game pad and will take control of Captain Olimar and any players using Wii remotes will play as Big pikmin, The idea of the game is to destroy blocks and defeat enemies in order to collect nectar, the nectar will give your character experience points and after collecting a certain amount of nectar that players character will level up. 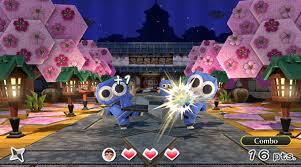 Leveling up is important as it will make your character more powerful, if you are playing as pikmin your objective is to use your fists to beat up the enemies but the player controlling Captain olimar will need to tap on enemies in order to hurl their pikmin at them (real pikmin not the other players). The goal is to reach the end of stage alive but be warned once all players are defeated its back to the beginning of the stage. I have never played a pikmin game before and after playing this I am detertimed too one day to at least play Pikmin 3. A small side mission you can do in the game is to use a pachinko machine in order to try and win prizes for your park, these prizes can be any thing from music you can play on the juke box, buttons which can do really cool things such as changing it from day to night and bits of memorabilia from the attractions. while playing all of these attractions you will notice that everything in the game is formed from some sort of hand made material for example in Mario chase the Yoshi Carts are made out of wood and appear to be wind up toys, in The Legend of Zelda Battle Quests everything is made of a cloth like material and you can even see the stitching and in the Pikmin game all of the creatures are robotic and also appear to be wind up toys. 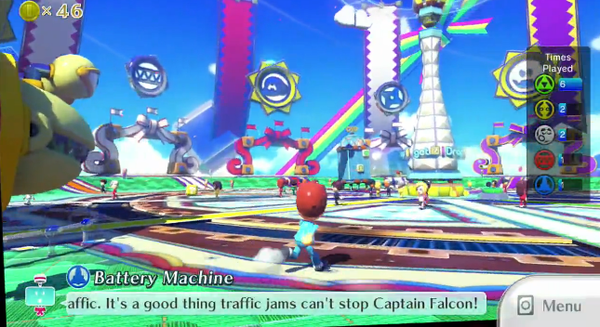 I believe this feature helps give Nintendo Land its own charm and it also helps show that all of the games are just attractions and that the player is in no real danger just like in an amusement park. The Music isn’t all that memorable but I think this is fine considering the purpose of the game, the idea of Nintendo Land is to help player get use to using the Wii U game pad while at the same time showing off some of its key features, so there is no need for epic orchestral masterpieces which you may find in The Legend of Zelda, Metroid and Super Mario Galaxy. The Music in Nintendo Land may not be that memorable but it is nice to listen too and for me that’s good enough. 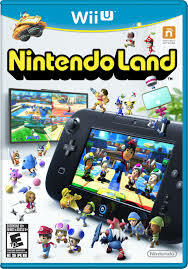 Nintendo Land is a fantastic game which definitely outlived my expectations, there were some attractions that I personally didn’t enjoy but I had a lot of fun with the attractions I did like. 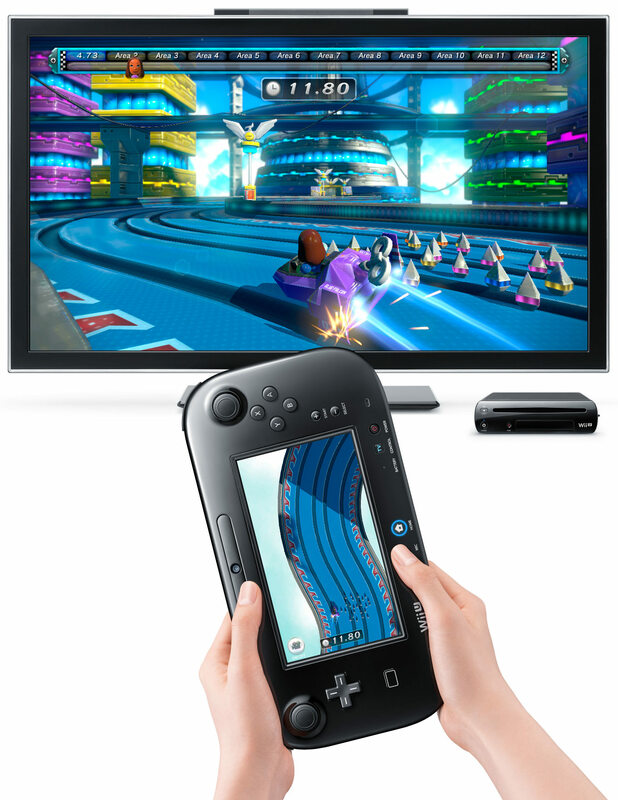 I am really happy that we didn’t get a sports game to show off the Wii U game pad as that was one of my biggest fears as Sports games are not everyone’s cup of tea but luckily Nintendo Land provides a variety of game play styles and challenges and I am certain that everyone will find something they enjoy. is actually good and the people are truly sharing nice thoughts. truly pleasant, every one be able to effortlessly be aware of it, Thanks a lot. i am just just following you. Enjoy discovering about your online page for the second time. Wonderful blog! Do you have any helpful hints for aspiring writers? I’m hoping to start my own website soon but I’m a little lost on everything. Would you recommend starting with a free platform like WordPress or go for a paid option? There are so many choices out there that I’m totally confused .. Any recommendations? Thanks a lot!